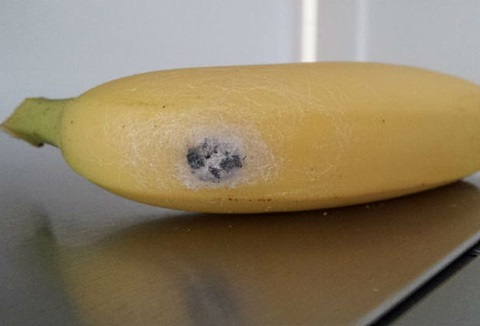 Eat Was A Spider That Can Cause Four-Hour Erections Found In A Bag of Bananas From Tesco? 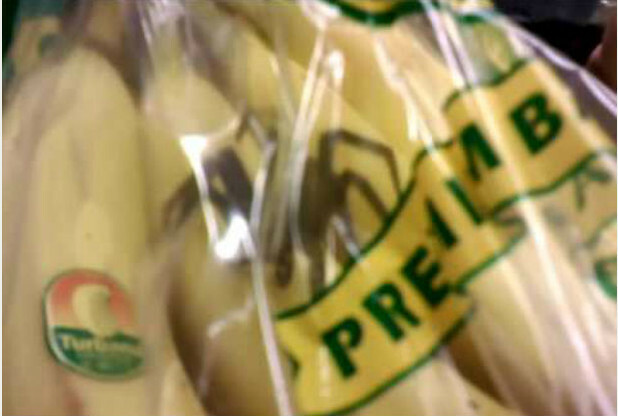 Was A Spider That Can Cause Four-Hour Erections Found In A Bag of Bananas From Tesco? And what was a Brazilian Wandering Spider doing in Bristol, U.K.? When we first heard about Bristol woman Maria Layton allegedly finding deadly Brazilian Wandering Spiders in the bag of bananas that her husband brought home from Tesco, we were intrigued. These spiders aren’t just scary because they’re spiders—a bite from them can give men erections lasting up to four hours, but can also cause death within two hours. While those facts might sound hard to believe, scientists are currently studying them in hopes of developing new erectile dysfunction treatments. Amazing that this rare and deadly spider could show up halfway around the world, right? The photos of the actual bananas and arachological evidence involved aren’t very clear. 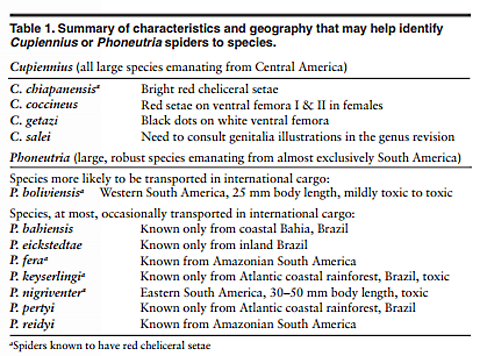 But arachnologist (scientist who studies spiders) Richard S. Vetter was so frustrated with constantly seeing stories of misidentified Brazilian Wandering Spiders that he published a paper in 2008 about how to tell them from the much more common, less deadly spiders that usually make it into cargo shipments. The paper appeared in the Volume 54, no. 2 (Summer 2008) issue of the scientific journal American Entomologist. According to Vetter, the main problem is that most entomologists (scientists who study insects in general) don’t have specific spider training. So when they’re asked to quickly identify a huge spider that someone found in a bag of bananas, they often rely on the Golden Guide for Spiders, which is considered rudimentary at best. (Note: I had an earlier edition of this same book that I used for a 5th grade science fair project, so it’s not exactly advanced.) Vetter also points out that because so many previous examples of misidentified spiders are all over the Internet, that’s probably an influence as well. Stop Googling, scientists. BWS are only found in the Amazon. Some less toxic members of the BWS family are found in highly populated areas of Brazil, but Brazil eats so many of the bananas that it grows, it doesn’t export much. 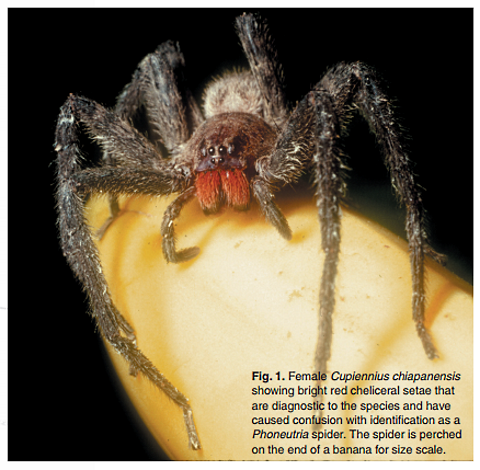 One particular Cupiennius spider, Cupiennius chiapanensis, was only discovered very recently—in 2006. Because they have red hairs in the same place as the most deadly of the BWS family, Vetter cautions that even some experienced arachnologists have been fooled. Misidentifying harmless spiders as incredibly deadly ones can have serious medical consequences, including using aggressive treatments on bite victims that do more harm than good. Vetter is currently doing a study on spiders found in international cargo—whether those arachnids are dead or alive. Check out the link for full contact information if you would like to assist in his research.